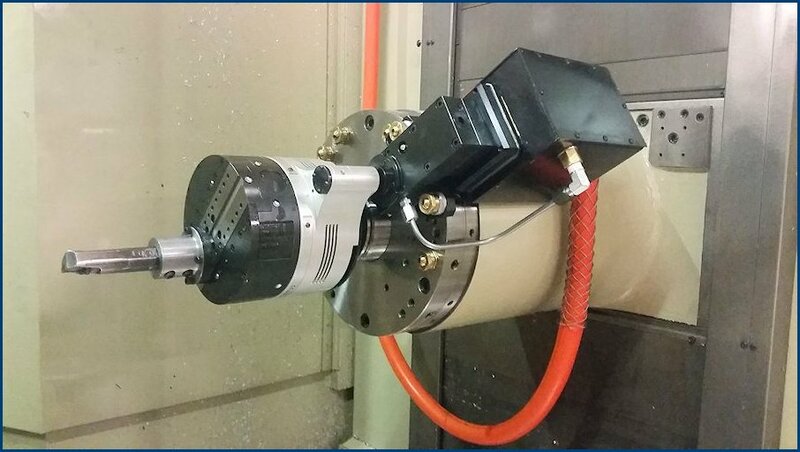 The D’Andrea U axis head is a CNC controlled linear axis which is mounted into the machine spindle. When interfaced with the machine CNC it can perform all types of cylindrical and conical boring, facing, threading, corner rounding and spherical operations. In some cases a simple U-control positioner with a wireless remote is preferred. This axis is not synchronous with the machine CNC axes but it allows turning, boring, facing, internal, external, threading, and conical operations to be performed. In most applications the D’Andrea U axis head can be loaded into the spindle using the automatic tool changer like any other cutting tool. In the loading process the U axis head is coupled to a servomotor which is mounted on the side of the spindle. The U axis is automatically enabled and the machining process continues uninterrupted. The D’Andrea U axis head is available in several sizes and is compatible with most machining centers. CNC Engineering has installed D’Andrea U axis systems on a wide variety of vertical and horizontal machining centers. We are the exclusive Integrator for D’Andrea systems, distributed by Ingersoll, in the U.S. and our experience and expertise with the electrical and mechanical installation requirements for these systems are unmatched.